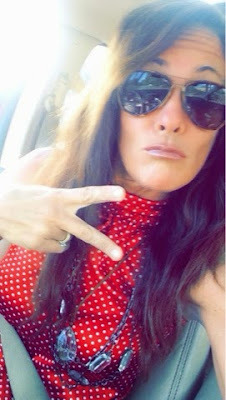 I am constantly being tagged in the photos on Instagram like...."post 20 random facts about yourself", or "tag 20 beautiful women"...you get the idea. I've never replied back with my 20. I feel kinda silly to list out 20 things on Instagram and honestly, I don't even know if I could list out 20 things about myself that are not running related. 1. I run runDisney events. Duhhhhhhh. Not only do I run lots of these events but I occasionally receive a little grief from people saying that it's just Disney, these are not real races. Nope. Respect the Distance, people! I will have runDisney's back any day of the week. Period. The End. 48.6 Miles is a real race, I don't care how ya look at it! 2. I listen to music 24/7. It drives my family and kids crazy but it's how I let my mind go. But yet, I sing and get the words all mixed up and that drives them even crazier! 3. My hair is too thick for cute little elastic headbands. I'm totally jealous when I see girls with a cute ponytail and no fly-aways. I go running down the road with my headbands poppin' off the back of my head. Not cute. 4. My favorite low-rise running socks are Balega. No blisters, lots of cush and not alot of logo. I do not own enough compression socks. I currently own one pair. What is my problem?? 5. I always wear sunglasses when I run. My eyeballs can't handle the sun and wind! Plus...they hide my old-lady wrinkles. Just sayin'. 6. My number one dream race is New York City Marathon. 8. 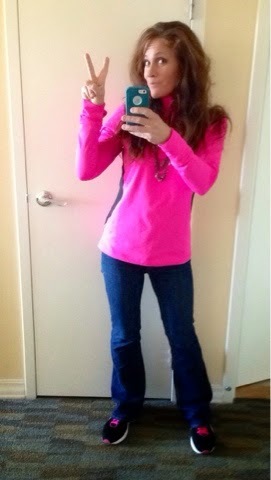 My personality doesn't match "Pink" but "Pink" is one of my favorite colors to wear when I run. 9. Speaking of wearing running clothes, I never wear race shirts to other races. That's like wearing Universal Studios character clothing to Walt Disney World Resort or wearing a Halloween shirt on Christmas Day. I just can't go there! 10. I own a ton of running gadgets. And use them all. 11. I'm a photo hoarder and can't delete. My phone is always full and I hate the phrase "Cannot Take A Photo". It makes being a #SelfieQueen kinda challenging. 14. I track all of my mileage. I try to Instagram each run but if I don't, I write it down. My calendar is a hot mess of miles logged. 15. Was asked the other day..."Do you think in 10 years that you will still be running?" My answer? "I will be running more." 16. If I could run a 5K race every weekend, I would. I love Saturday morning race days. Nothing better than seeing all of my friends and getting in a good run. Those are my favorite ways to kick off the weekend. 17. I answer the phone to my kiddos like they have just placed a Chinese food order. I have NO IDEA why we started that but they are like..."No Mom, we didn't order egg rolls." LOL. 18. I'm on Blood Pressure Medication and sometimes need my inhaler when I run. Big Time Bummer. My Cardiologist was not amused in the ER when I came in wearing a Marathon shirt. 19. I drink a HOT cup of coffee before I run and after (even if it's 100 degrees outside). I freeze after I quit running. 20. I'm a gypsy at heart and am always dreaming of running somewhere far far away. One day, I'm going to cross off my Bucket List Races. It's going to take me a little while to do it but it WILL Happen! That was fun and not so painful....I'm SURE that I could think of 20 more Random facts if I sat here for a few more minutes because I just opened up my fridge and thought, "well that's just lovely. I didn't even talk about guacamole and banana bread on the list." 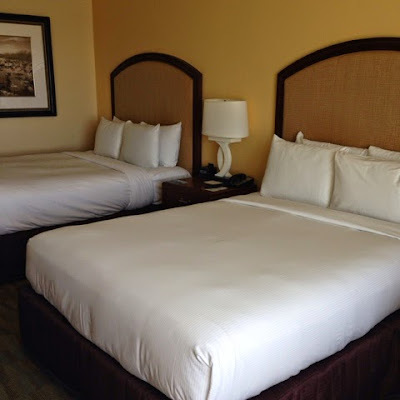 Hilton Orlando Bonnet Creek Review! 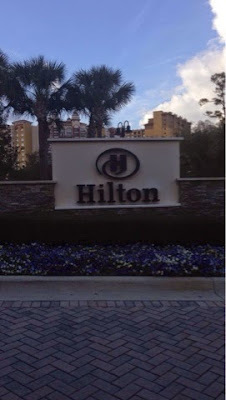 I had the pleasure of staying at Hilton Bonnet Creek Resort during Disney's Princess Half Marathon Weekend and if I could use one word to sum up the weekend, it would be "ELEGANCE". Why "Elegance"?? 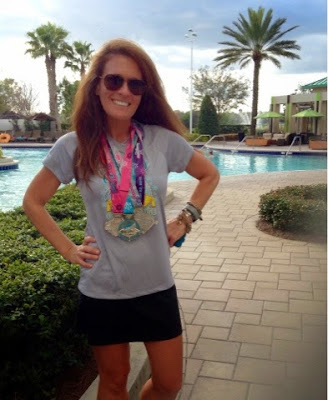 I chose that word because from the moment that I walked into the resort to the moment that I had my Princess Half Marathon Medal draped around my neck, I was emmersed in "Elegance". Everything about this Resort and Race is sparkly, pretty and all about channeling your inner Princess. Now over the course of my 42 year life span, I have visited Walt Disney World Resort more times than one should probably admit to. I know, I know. Most people don't come anywhere close to understanding this part of my life. And guess what?? That is OKAY by me. I'm a repeat offender.....check out my stay and more photos of pre-race festivities during runDisney's Wine and Dine Half Marathon here. However, there are many people who do understand why I keep returning to "my happy place" as most Disney-loving people like to call it but I would be willing to bet that those same people don't use the words "Disney" and "Elegance" in the same sentence. To most, a Walt Disney World Resort Vacation (or Run-cation in this case), will require a vacation from your vacation when you return home. To some degree, this is the truth. There is A LOT to see and do. 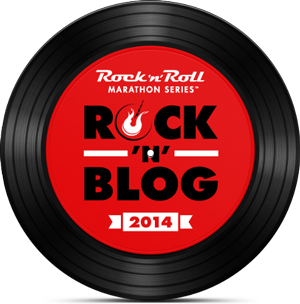 There are many parks, restaurants, attractions and races to run!! Whew!! I'm tired just typing this. I'm super guilty, I try to pack in so much over such a small amount of time. But again, let me state the word that I chose. "Elegance". There is a valid reason. Welcome to Hilton Orlando Bonnet Creek! I have stayed on property at Walt Disney World Resort many many many times in conjunction with runDisney event weekends. I have always felt like that I'm always trying to navigate my way around. Always trying to figure things out. Where do I go? What time does the Expo open? What are the race procedures?? The races are popular, huge and overwhelming at times. So many things to do and figure out. So many people. So much hustle and bustle. The VERY LAST thing that I want to be worried about when I'm visiting Walt Disney World Resort during race weekend is the hustle and bustle. When I'm ready to unwind, I'm ready to unwind!! It's hard for me to unwind anyways.....I'm just not geared that way. 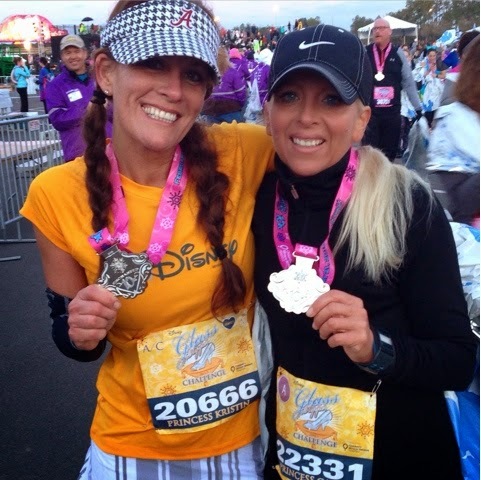 For years, I would stress myself out over EVERYTHING when it came to runDisney run-cations. Ready to have some fun with my running pal at Hilton Bonnet Creek Marathon Weekends!! I have actually found that relaxing during race weekend is a good thing. I am letting other people handle the details. I am sitting back and taking it all in. And believe it or not, I am having the time of my life during the race because I'm just relaxed going into it. This girl is ready for fun #MarathonWeekends! Besides....WHO could be stressed out when you are sleeping on these comfy beds before a race?? ....And WHO could be stressed with a room with THIS view!! Aaaaahhhhhh!!! So Beautiful! Several Princesses could adjust their tiaras in here. Special complimentary bus transportation is provided for the runDisney events. Pre-race celebration followed by loading the buses and then one BIG send-off to get the party started! (Bus sign-up is required). Please see the Runners' Concierge to reserve your spot on the bus! Return transportation post event will depart every 30 minutes from event location. See the Runner's Resort Guide for information on Specatator Transportation as well. Get Fueled Race Day Morning! Before the race, enjoy complimentary items in the Convention Center entrance foyer, adjacent to Zeta Bar. 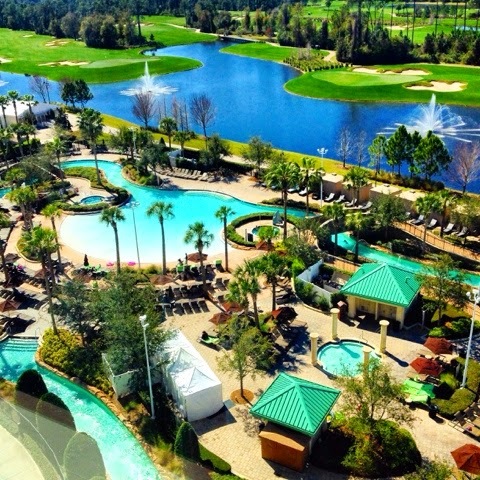 The World-class Waldorf Astoria Spa is just steps away at the adjacent Waldorf Astoria Orlando. Reward yourself with a pampering treatment after the race. Same-day appointments may be available. To book your Spa Reservation, call 407-597-5360. Participants of runDisney events have a chance to WIN A WEEKEND STAY at Hilton Orlando Bonnet Creek by predicting their expected finish time. Entry forms are located in your welcome bag. Only one entry per participant. 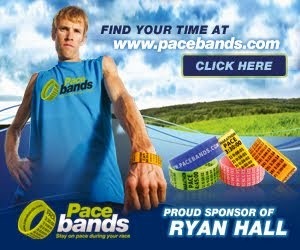 The runner closest to his or her time will be named the winner. Drop off your completed form to the Runner's Concierge before your race. Carb Load at one these three great restaurants on property! La Luce- Open 5-11pm. For "carb loading," our signature restaurant will feature a la carte pasta dishes. Harvest Bistro- Dinner 4-10pm. Featuring a "carb loading" dinner menu, for $16 per person. Muse- Open 24 hours. Featuring gourmet coffee, pastries, garden fresh salads and sandwiches. 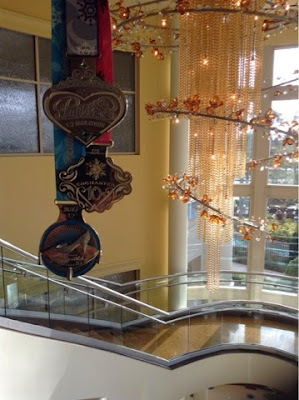 I had such a FABULOUS time running the Disney's Princess Half Marathon Weekend and staying at the Hilton Orlando Bonnet Creek Resort! 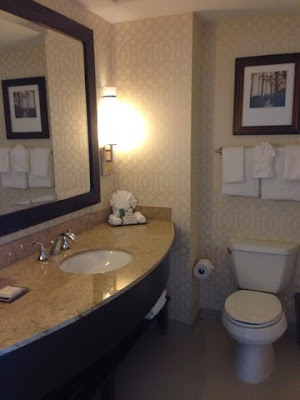 I will definitely make plans to stay there again for my future runDisney events and family vacations. 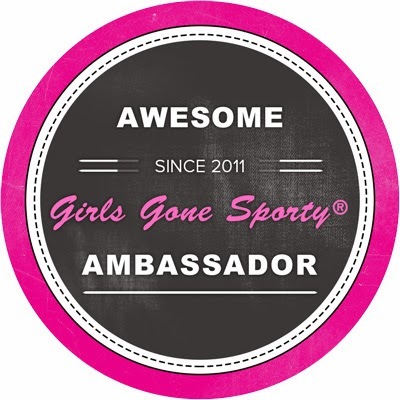 Feel free to shoot me an email or find me on Twitter or Instagram at @Bamagirlruns if you'd like to have me answer any more questions about a future runDisney run-cation at Hilton Orlando Bonnet Creek or Waldorf Astoria Orlando! For more information on #MarathonWeekends please visit Hilton Bonnet Creek. 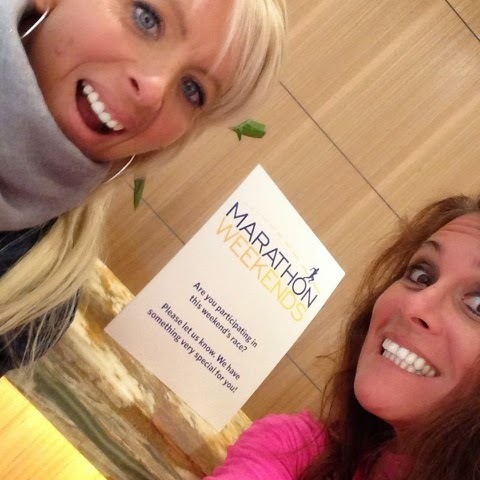 Happy Running and Hope to see you soon at #MarathonWeekends! 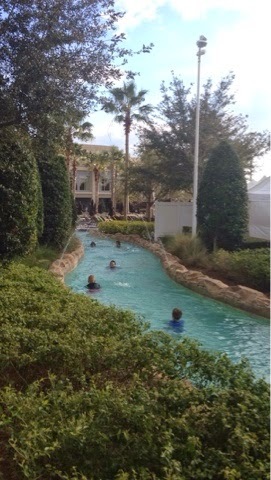 Disclaimer: I received a complimentary stay at Hilton Orlando Bonnet Creek in exchange for my honest opinion regarding #MarathonWeekends. I cannot express how much I love this resort and plan to stay here for many future vacations at Walt Disney World Resort.